The solution to a warmer drier more comfy home. Low E is an abbreviation of “Low Emissivity”, which is the ability to radiate absorbed energy. Low E glass has a unique Low Emissivity coating designed to reflect long wave radiation from the glass itself and from inside or outside the house. Heat loss can reduce from 45% to 28% by using a Low E double glazed window. Low E double glazed windows improve on the minimum performance of the window in houses as required by the NZ Building Code. 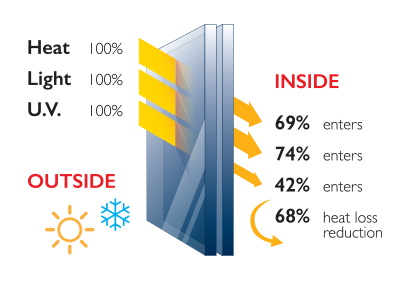 Improving window insulation will save on heating requirements in the winter and cooling requirements in the summer. Low E double glazing makes the internal glass temperature warmer and therefore reduce the onset of condensation on the inner glass surface. Minimum room temperatures are recommended to be 16°C at night and 18°C during the day. Higher room temperatures around 20°C-22°C are considered comfortable and help to reduce condensation. Low E double glazing is so efficient, that in certain conditions, they can sometimes cause the outer panes to dew as the outer pane surface is colder. Solar Low E glass is best at reducing solar heat gain while maintaining insulation and high visibility. Low E double glazing can help protect furnishings in the home from fading by reducing levels of UV light from the sun. Large areas of clear glass can let in too much light and create glare. Solar control Low E double glazing works like sunglasses and control the Visible Light Transmission (VLT) and thus glare inside the house. Double glazing reduces the sound transmission compared to single glazing so they make the environment quieter and more comfortable. By using thicker glass and or glass panes of different thickness the acoustics are improved. Special acoustic glasses can be included in the double glazed unit if required. Toughened Safety Glass is ideal for safety, strength and temperature resistance. Toughened Safety Glass is ideal for high impact areas such as doors. Laminated Safety Glass can be used for safety and security if required.